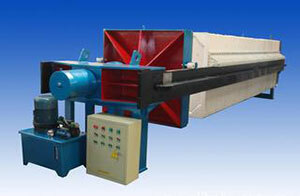 Filter press can be divided into frame filter press and recessed filter press. It is a kind fo pressure filtration equipment for intermittent operation, being appalicable in any solid-liquid seperation for suspengding liquid. It depends on compaction device to press filter press then push the suspending liquid into chamber room by the pump, the filtration cloth can separate the solid and liquid material. It has the feature of simple structure, good separating effect, convenient operation, wide range of application. It is widely used in fields of coal washing, alchol, petroleum, chemical industry, dyeing, metallurgy, medicine, food, textile, industrial sewage and urban domestic sewage treatment. Our company manufactures all kinds of filter press, hydraulic filter press. It also used for separating the bleaching oil. It has manual operation, and hydraulic type for your choice.